The following are the latest results contributed by HM Courts Service, for cases sentenced by West Sussex Magistrates’ Court sitting at Worthing and South East Hampshire Magistrates’ Court sitting at Portsmouth from November 7 to 11, 2016. Stephen Foster, 31, of St George’s Walk, Eastergate, was fined £105 and must pay £75 costs after admitting breaching a community order by failing to attend induction appointments. William Rhodes, 29, of Shripney Lane, Bognor Regis, was fined £200 and must pay £75 costs after admitting breaching a community order by failing to attend unpaid work. Philip Southgate, 30, of Milestone Cottages, Birdham Road, Chichester, admitted breaching a community order by failing to attend unpaid work. The order was revoked and he was given a 12-week prison sentence, suspended for 12 months, for the original offence of stealing £1,455.55 from The Earl of March pub in Lavant on July 18, 2015. He must also pay £75 costs. Arwid Jurkiun, 21, of Hilsea Crescent, Portsmouth, was fined £300 and must pay 330 victim surcharge, £85 costs, after admitting being in charge of a car in Nelson Road, Bognor Regis, on October 22, 2016, while over the drink-driving limit (109mg of alcohol in 100ml of breath). He was disqualified from driving for three months. Sukhjit Athwal, 46, of Binsted Lane, Binsted, was given a 12-week prison sentence, suspended for 12 months, and 12-week curfew, electronically monitored, between 8pm and 6am, after admitting drink-driving (143mg of alcohol in 100ml of breath) in Nyton Road, Westergate, on October 17, 2016. He must pay £115 victim surcharge, £85 costs, and was disqualified from driving for 36 months. Antonio Silva, 61, of Arun Road, Bognor Regis, was fined £212 and must pay £30 victim surcharge, £85 costs, after admitting drink-driving (70mg of alcohol in 100ml of breath) in Queensway, Bognor Regis, on October 22, 2016. He was disqualified from driving for three years. Richard Collier, 26, of The Old Post Office Cottages, Main Road, Yapton, was given a community order with Rehabilitation Activity Requirement and must carry out 50 hours’ unpaid work after admitting drink-driving (55mg of alcohol in 100ml of breath) in Wick Street, Wick, on September 16, 2016; and drug-driving 2.2 Delta-9-THC) in Wick Street, Wick, on September 16, 2016. He must pay £85 victim surcharge and £85 costs. He was disqualified from driving for 16 months for the first offence and disqualified from driving for 12 months for the second offence. He also admitted driving without insurance or a licence, no separate penalties. Tahir Emmons, 20, of Abbess Close, London, was fined £120 and must pay £30 victim surcharge, £85 costs, after admitting drug-driving (2.1mg Delta-9-THC per litre of blood) on the A27 Fontwell on September 14, 2016. He was disqualified from driving for 12 months. 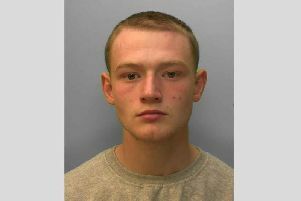 Daniel Yates, 26, of Queens Square, Glamis Street, Bognor Regis, was given a community order with Rehabilitation Activity Requirement and must carry out 50 hours’ unpaid work after admitting drink-driving (84ug alcohol per 100ml) in Collyer Avenue, Bognor Regis, on October 27, 2016; and making off without payment for petrol at Tesco, Bognor Regis, on October 26, 2016. He must pay £41.19 compensation, £85 victim surcharge and £85 costs. He was disqualified from driving for 36 months. He also admitted driving without insurance or a licence, no separate penalties. Christopher Kelly, 70, of Prior Cottages, London Road, Hardham, was fined £100 and must pay £20 victim surcharge after admitting driving over the 30mph speed limit on the A283 Storrington on February 25, 2016. His driving record was endorsed with three points. Shane McIntosh, 28, of Defiance Place, Bognor Regis, was fined £100 and must pay £20 victim surcharge after admitting failing to stop at a red light in Felpham Way, Bognor Regis, on August 3, 2016. His driving record was endorsed with three points.